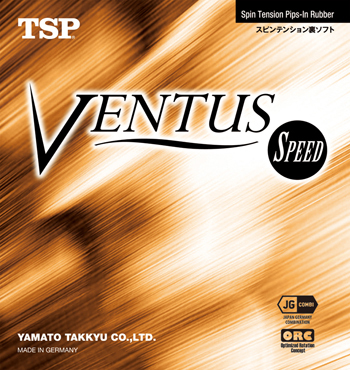 Ventus Speed is the hardest and fastest variant of the TSP Ventus series. When designing this offensive rubber, the Japanese rubber experts focused on perfect balance between high speed, maximum spin development and great control. The open-pore 45° sponge of Ventus Speed features the new “Optimized Rotation Concept” and is truly made for spin. Thanks the new sponge design, this new TSP development guarantees longer ball contact which results in more rotational energy transfer on the ball. In addition, the higher trajectory resulting from the “Optimized Rotation Concept” provides for great feel and more control in your play. The fast performance top rubber sheet of Ventus Speed develops tons of power and tremendous drive both for aggressive opening loops and mid-distance topspin attacks.